The Geek was how we best knew the Anthony Michael Hall of the 80’s. Sixteen Candles, The Breakfast Club and Weird Science saw him play all similar types of character. After a decade out of the limelight, he’s come back to have his own hit show, The Dead Zone, as well as a role in the movie of the year, The Dark Knight. Anthony Michael Hall was born on 14th April, 1968 in Boston, Massachusetts. He is one of very few actors that managed to achieve success in the 80’s and again in the 00’s. Anthony was born Michael Anthony Thomas Charles Hall but dropped the Michael and the Charles. His career began in the late 70’s, appearing in various commercials before a couple of solid screen performances in the TV movie The Gold Bug followed by the 1982 Kenny Rogers film Six Pack. The next part of Hall’s career would surround his relationship with John Hughes, starring in Sixteen Candles, The Breakfast Club and Weird Science. In Sixteen Candles, Hall was cast as the geek, Farmer Ted. He really stole the movie with his performance and this led to similar roles in both The Breakfast Club (Brian Johnson) and Weird Science (Gary Wallace). All three roles were in the geek mould and all were played to perfection by Hall. Worrying about being typecast, Anthony turned down parts written specifically for him by Hughes in both Ferris Bueller’s Day Off and Pretty In Pink. Hall instead took a part in 1986 film Out Of Bounds, a critical and financial disaster, taking only $5m at the US Box Office. 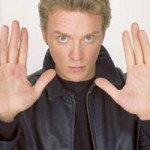 At the age of 17, Anthony Michael Hall became the youngest ever member of the cast of Saturday Night Live. He didn’t stay with the show long and never really achieved what he wanted to although he was grateful for the learning experience. 2002 saw Hall come back to somewhere near his success of the 80’s with the lead role in TV show, The Dead Zone. Hall plays Johnny Smith, a small town teacher involved in a car accident that leaves him in a coma for six years. He awakes with certain powers and visions that he eventually uses to help solve crimes. The show debuted on June 16th 2002 and drew the highest ratings for a premiere than any other cable series in television history. 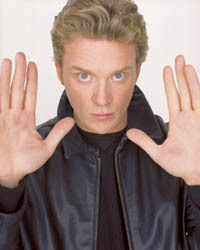 The Dead Zone is currently into its 5th season and has been picked up for a 6th, due to start in the summer of 2007. Anthony Michael Hall – The official Anthony Michael Hall website.